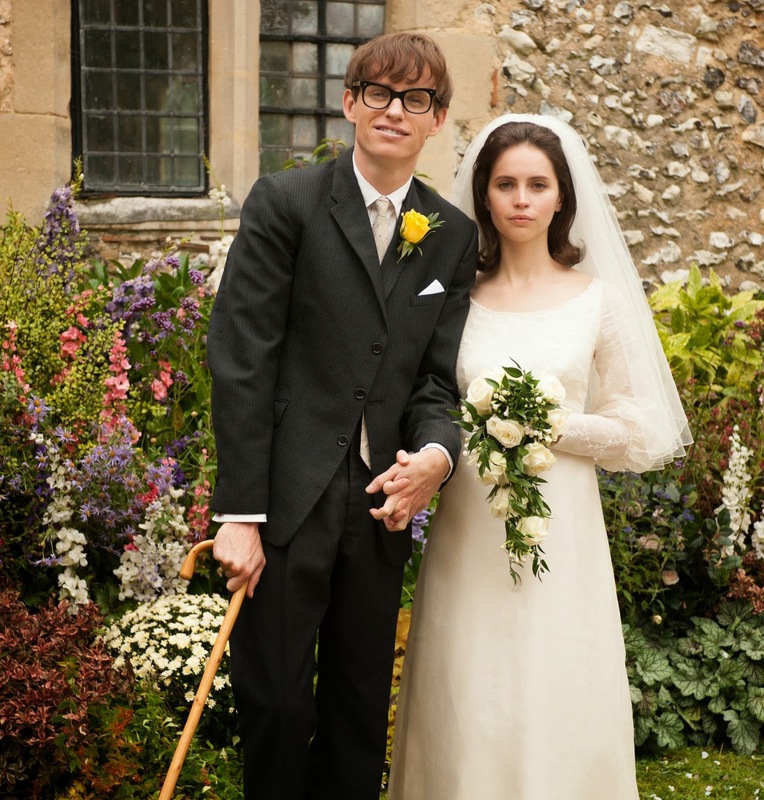 THE THEORY OF EVERYTHING is a well-acted but ultimately banal biopic of the famous physicist Stephen Hawking (Eddie Redmayne) as told from the perspective of his first wife Jane (Felicity Jones). As it opens, the young couple meet at Oxford University in the 1960s and are immediately smitten with each other. Almost simultaneous with their courtship over the first half hour of the film is the discovery that Stephen suffers from Motor Neurone disease with perhaps only two years left to live. It is testament to Jane's courage that she refuses to be shut out of Stephen's life and drops her own studies to marry him, raise his children and nurse him as he makes his reputation as one of the great scientists of our age. But as we move into the second half of the film, while they both clearly still love each other, the cracks are starting to show. Jane, who has always been religious in contrast to Stephen's atheism, falls in love with her Church choir leader, an earnest widower who becomes a kind of surrogate husband and father with Stephen's apparent blessing. And then Stephen, forced to have a tracheotomy, and before he gets the computer voice we have come to associate with him, falls for his physical therapist. My problem with this film is that there is no dark backing to the mirror. All four lovers are kindly and good and they are surrounded by people who are kindly and good. When Stephen and Jane discover that they need something else it is done with the greatest of sensitivity and kindness. They remain friends. It's all just so nice. And this leaves the movie without any dramatic tension. Moreover, director James Marsh (MAN ON WIRE) refuses any attempt to take us into the mind and interior experience of Stephen, bar one short scene where he tilts the lens to give us the angle at which Stephen must see the world with his neck awkwardly angled. There is never any kind of footage similar to that of THE DIVING BELL AND THE BUTTERFLY that attempts to look out through Stephen's eyes. And as for the science, well, there's even less attempt to explain it here than in THE IMITATION GAME, although in fairness, that's a tall order. But without any visual panache, or attempt at science, or dramatic tension, what is there? Nothing except the technical brilliance of Eddie Redmayne's performance. For me, that wasn't enough. THE THEORY OF EVERYTHING has a running time of 123 minutes and is rated PG-13. The movie played Toronto 2014 and was released last year in the USA, Cambodia, Hong Kong, Taiwan, South Korea, Austria, Germany, Israel and Uruguay. It opened this weekend in the UK and Ireland. It opens in Croatia and Singapore on January 8th, in Italy, the Netherlands and Spain on January 16th, in Belgium and France on January 21st, in Hungary on January 22nd, in Australia, Greece and Portugal on January 29th, in Estonia, Lithuania, Poland and Sweden on January 30th, in Argentina and New Zealand on February 5th, in Finland, Latvia and Norway on February 6th, in Slovenia on February 19th, in the Czech Republic, Denmark an Russia on February 26th and in Turkey on February 27th.